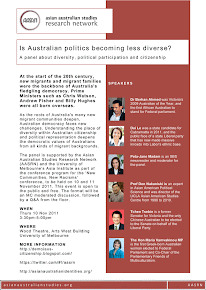 As part of the Diversity, Political Participation and Citizenship public panel, Professor Don Nakanishi was interviewed for ABC Radio's Connect Asia program by Sen Lam. You can find a copy of the podcast here. You'll find Don's interview as '11/11/2011 Part 2' under 'Listen to the Latest Program'.